Michael Jordan is the greatest basketball player of all time. But his pre-eminence is more than just extraordinary athletic ability: the lessons of his life-such as focus, passion, hard work, perseverance and accountability-have shaped him into one of the most revered celebrities of the 20th century. In this inspiring book Pat Williams, motivational speaker and senior vice president of the NBA's Orlando Magic, reveals Jordan's method for living a life of greatness that we can all incorporate into our lives. Fascinating anecdotes and quotes from those who know Michael best provide a glimpse into a persona as sweeping and immense as any generation has ever witnessed. Peppered with examples from Williams's life and those of other star athletes and celebrities, this uplifting book shows that we are, indeed, all capable of fulfilling our full potential. Readers from all walks of life can appreciate and aspire to living life like a champion. Even though tens of thousands wear Air Jordans, there will never be another who fills Michael Jordan's shoes—and I know from personal experience! I am flattered by comparisons, but realistically I can never live up to his achievements. What MJ has done for basketball, sports in general, race relations . . . it's incalculable. It's time to give "Who's going to be the next Michael Jordan?" a rest. It's unfair to Michael and to every other aspiring athlete. The fascination with MJ continues. Will he return? People want him back so badly. He has had such an enormous hold on us and our culture. His presence as an active player has been sorely missed. The eleven chapters that follow capture Michael's persona perfectly. He schooled us on and off the court, and as one of his students, I give him A pluses across the board. Focus. With a game on the line, MJ could achieve a level of focus no one else could reach. He never got rattled. His concentration was impenetrable. It was part of his genius. Passion & Energy. Michael is passionate about basketball and truly loved playing. His energy level allowed him to overcome fatigue in a remarkable, transcendent way. Work. Difficult as it is to recall, MJ did have weaknesses when he entered the NBA, but he worked tirelessly to improve and soon those weaknesses—defense and outside shooting—became his added strengths. Perseverance. MJ won through his will. He was such a tough opponent because he would never quit. I can speak firsthand as to how frustrating that is to an opponent! Responsibility. MJ lives—and thrives—under a microscope. I believe this visibility intensifies his sense of responsibility to his sport, family, community and country. Influence. What an influence and impact MJ has been to millions—not simply to the wannabes on the playgrounds—but to us in the NBA, too. Tracy McGrady, Shaq, Kobe, Allen Iverson and I are still striving to emulate him—yes, to be like Mike! He is truly the role model's role model. He personifies how to conduct oneself on and off the court. Competing and Winning. I believe his competitive juices boil. It is known far and wide that MJ hates to lose, be it a simple card game or a Game Seven in the Finals. He always wants to win and that championship passion fuels him. Teamwork. MJ is the ultimate one-on-one player, yet he understands that winning big is determined by involving his teammates. Putting that philosophy in sneakers daily translated into a dynasty of six titles in eight years. Leadership. MJ leads by example. He demands no more from his teammates than he demands from himself. Respect, Trust, Loyalty. Michael has a great respect for the game and the people in the game, and he reveres his predecessors who provided the foundation for today's NBA. When you respect people, they trust you, and trust breeds loyalty. For example, the loyalty MJ had for coach Phil Jackson is rare in our profession. Character. Michael is certainly not perfect. He is flawed like the rest of us. It is obvious to those of us who know him well, and probably to even casual observers, that quality of character has been embedded in his make-up. How else can one explain his self-discipline, humility, honesty, integrity and courage? Pat Williams and Michael Weinreb have captured the essence of Michael Jordan in an extraordinary way. This book is thoroughly researched, and the lessons from MJ's career are so vividly explained that you will be able to apply them in your life. When you have "completed the MJ course," you will discover that all of us can be like Mike. Only those who respect others can be of use to them. This is a story from Birmingham, from 1994, when Michael Jordan was nothing more than another minor-league baseball player striving for an opportunity. It was a brilliant afternoon, warm and sunny, and he was on his way to the ballpark, cutting through a sprawling suburban neighborhood. He passed a boy, ten years old, playing basketball in his driveway, alone. The boy's name is not important. It could be any boy. What matters is what the man did next. He stopped the car. He got out. The boy considered him. The boy knew who it was. "Mind if I join you?" Jordan asked. They played for twenty minutes, passing, rebounding, shooting, the world's greatest basketball player and the boy, no one disturbing them. Then Jordan got in his car and drove away. The boy's parents weren't home that afternoon. When he told them, they didn't believe him. No one believed him. It was like something out of Grimm's Fairy Tales. "Finally," said Birmingham Barons general manager Tony Ensor, "one of the neighbors verified his story." Here is the Michael Jordan we don't see. Here is what exists beyond the iconography. It is not a prepackaged smile, not a silhouetted T-shirt slogan, not a commercial spokesman, not a towering image on an IMAX screen. No. Here is a man. And here is a child. It could be any child. Say a nine-year-old with disfiguring burns. Or a teenager in a wheelchair who can move nothing except his eyes. Or a Make-A-Wish kid crippled by a rare and terminal disease. Or one of the perfectly healthy kids at his summer basketball camp. Or the son of an opposing coach. The point is, it does not matter. (c)2001. All rights reserved. 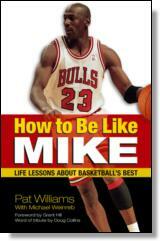 Reprinted from How to be Like Mike by Pat Williams, Michael Weinreb. No part of this publication may be reproduced, stored in a retrieval system or transmitted in any form or by any means, without the written permission of the publisher. Publisher: Health Communications,3201 SW 15th Street, Deerfield Beach, FL 33442. Pat Williams is a basketball Hall-of-Famer, currently serving as co-founder and senior vice president of the NBA's Orlando Magic. Pat has been the general manager with NBA teams in Chicago, Atlanta, Philadelphia and Orlando, including the 1983 World Champion 76ers. In 1996, Pat was named as one of the 50 most influential people in NBA history. In 2012, Pat received the John W. Bunn Lifetime Achievement Award from the Naismith Memorial Basketball Hall of Fame.is senior vice president of the NBA's Orlando Magic. With more than 50 years of professional sports experience; he has written more than 100 books, including the popular Coach Wooden, How to Be Like Mike, How to Be Like Coach Wooden, and How to Be Like Women of Influence. Also one of America's top motivational and inspirational corporate speakers, Pat has addressed employees from many of the Fortune 500 companies. Visit: www.patwilliams.com.